The Bend Bulletin—Sunday, Sept 6, 2016 (updated Sept. 8, 2016): Bend church still winning design awards a year later: Church certified for its green construction. "Leadership at Unitarian Universalist Fellowship of Central Oregon calls its new building as a gathering place for all people ..."
The Bend Bulletin—Jan 28, 2016: Unitarian church wins award. 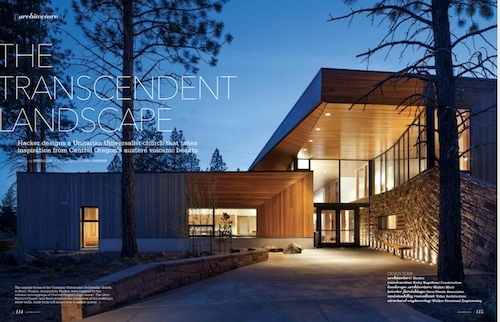 "The new meeting hall of the Unitarian Universalist Fellowship of Central Oregon has won national recognition in the 2016 Wood Design Awards..."
WoodWorks Wood Design Award 2016 – 2016 Green Building by Design - Design Award Category. The competition celebrates the use of wood in structural and finish applications in commercial and multifamily buildings. Included in Celebrating Excellence in Wood Architecture, 2015-16 Wood Design Award Winners, pp 314-321. Faith & Form/IFRAA International Awards Program for Religious Art & Architecture 2015 – Honor Award for New Facilities. Architect, Corey Martin's proposal (PDF) emphasizing how the geology of Central Oregon and Unitarian Universalist principles informed the geometry of the design for our building.